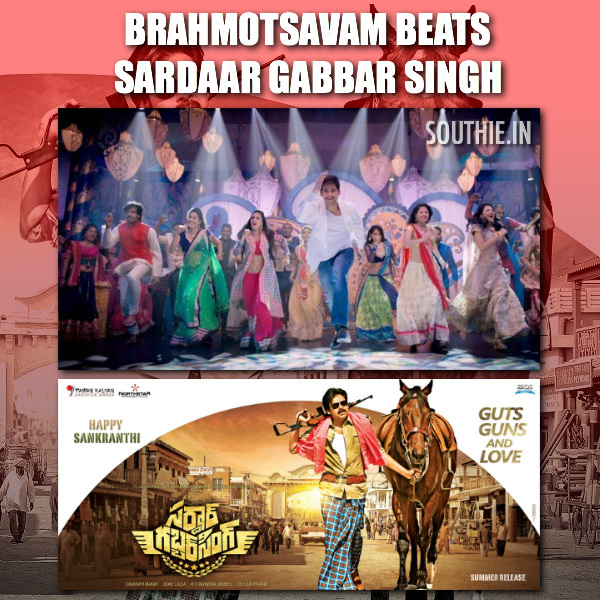 Home/NEWS/Brahmotsavam record beats Sardaar Gabbar Singh by 3 crore. Brahmotsavam record beats Sardaar Gabbar Singh by 3 crore. Though it is only in one area, all the other area’s Sardaar Gabbar Singh leads Brahmotsavam by a mile. Mahesh Babu’s first and biggest release for 2016 is Srikanth Addala’s Brahmotsavam. Pawan Kalyan is coming back with a full length role only after Attarintiki Daredi. Pawan Kalyan and Mahesh Babu being two of the biggest stars of Telugu cinema. This summer will witness the clash of films of both Pawan and Mahesh, ‘Sardaar Gabbar Singh’ and ‘Brahmotsavam’ respectively. Though they might compete head on, the box office figures, theatrical rights and everything will lead to a lot of comparisons. There are some good news and some bad news for the fans of the Superstar. Mahesh Babu’s Brahmotsavam has beaten Pawan Kalyan’s Sardaar Gabbar Singh record in overseas. The overseas rights of Mahesh Babu-Kajal Aggarwal starrer film has fetched a whopping Rs 13 Crore while Pawan’s Sardaar was sold in overseas for Rs 10.5 Crore. This is not all. Mahesh has also broken Baahubali’s record which garnered Rs 9 Crore from overseas theatrical rights and thus Mahesh emerged as the Overseas Baadshah. Pawan Kalyan has garnered an overall lead by fetching a record 90 crore in Pre-release business, standing next only to Baahubali. Pawan Kalyan’s ‘Sardaar Gabbar Singh’ has created new records in terms of pre-release business in almost all areas. The action entertainer is only next to Baahubali in every area barring overseas. On the other hand, Mahesh’s ‘Brahmotsavam’ is also doing good business but it is unmatchable when compared to Sardaar Gabbar Singh.